If you're the outgoing chairman at a board meeting then the tone of your final speech will depend on the nature of your exit. If you are stepping down from the board because you are retiring or want to hand over for other reasons, then you are more likely to be positive about the company than if you have been ousted by a boardroom coup. However, if you are stepping down under a cloud then it's unlikely you'll get a chance to address a final board meeting. So for the purposes of this meeting we'll concentrate on the former situation, stepping down to give way voluntarily. There's really no need for an introduction as everyone will know who you are, so restrict the preamble to thanking the board for the opportunity to speak at your final meeting and telling the board what you will say. Beware of taking up too much time with this section but give a brief overview of your experience with the company and your time as chairman. Example: I joined the company just over fifteen years ago and have been the chairman for the past eight years. I've overseen a period of controlled growth and I'm really happy to be leaving the company in its current situation, although I'm well aware that it is the efforts of all the board members and their teams that got us here. It's a good time to take the opportunity to thank those people, both present and absent, who have given you specific help. Example: I thank you all for the support you've given me but particularly those who have acted as deputy chairman during my tenure and Jean Wills who has been my personal assistant throughout my term. I also thank you all for the engraved tankard and golf clubs which I assure you will be used well when I get the chance! 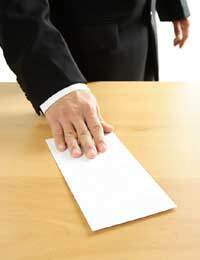 This will be your last opportunity to exert any influence on the board so think carefully about how you close. Even though you might have had some hard battles in the boardroom, no one wants to be remembered having a pop at everyone on their last day. Example: It's not always been easy sitting in this chair but the best challenges always have their ups as well as downs. I've enjoyed every minute that I've been here and I hope my successor can take the company on to even greater heights. Your speech should last no more than 10 minutes, ideally less. As you're speaking to people who'll mostly know who you are, you should only mention one or two real highlights from you career, and you can end with your vision of the company for the future, after your departure. That ends on a very positive note, and gives your successor something to strive for, which is no bad thing, especially if you've enjoyed your tenure and you're well regarded. Always set the bar high for people and they'll try to clear it.